When Reen and Mo come to visit they often request this pasta. Now if you’ve been to a Primi Piatti and not had the Recco pasta you are missing out! I absolutely love the flavour combo of this, which is a tomato base with curry flavour and rounded off with cream. Normally I just have it as a meat free sauce, but easy peasy lemon squeesy add some chicken for a bit of protein. This is such a good pasta sauce and you really won’t have unhappy dinner guests – also this is ridiculously easy and quick to make. I made it after popping my tyre on De Waal drive which made things a bit late. Note to self don’t pop a tyre on De Waal – it’s scary! Also I am superbly glad that I know how to change a tyre, otherwise it would’ve been a bit difficult. Thank goodness two people stopped to help – there are good people out there! Anyways thats a totally different story. Back to the pasta. Heat up some garlic and curry leaves in some oil, if you’re adding the chicken now is a good time to do it. Then its time for some tomato paste, tomato and garlic sauce and a bunch of other yummy goodies. Cook that through add in cream and curry powder and voila you’ve got some goodness going. I like to serve fresh coriander and slices of chilli on the side so you can add as you like. Oh wow – totally could do with some of that now! Pity I didn’t make extra and freeze (ps the sauce actually freezes rather well). Yummy deeeeeelish! And thanks to Reenie we had an awesome garlic bread to go with it and a good glass of red – def recommended. I’ve had some requests for the recipe that I use … so here we go! I don’t use an exact recipe, mostly done to taste and flavour, sometimes I need more of something else … Moral of the recipe – Taste Your Food! Once you’ve cooked your chicken (or you can leave this out entirely and just make the sauce). Heat up some oil in a large pot, add in the fresh garlic, curry leaves and a little bit of the fresh chilli (depends on your taste with the chilli you can leave it out completely and serve on the side)Once heated through and you can smell something delish pour in the pasta sauce, add the sugar and salt as well as the tomato paste. Cook this for a while until it starts to bubble slightly, but don’t let the bottom burn. Add 1 tsp of curry powder to start, cook this for a few minutes and taste, see what you think if you’re happy with the flavour then don’t add more. But I usually find it needs a bit more curry powder. Remember to add in smaller batches and cook it for a few minutes before adding more. Finally add in the cream and mix it all together, cook for a few more minutes before you add the chicken (if you’ve using it). Wait until your chicken is heated through before you serve on pasta. Add coriander when you serve – or let your guests do this themselves (although the coriander, cream and curry powder make this dish for me). I serve fresh coriander and and slices of fresh green chilli on the side. Enjoy! And let me know how your dish turns out! 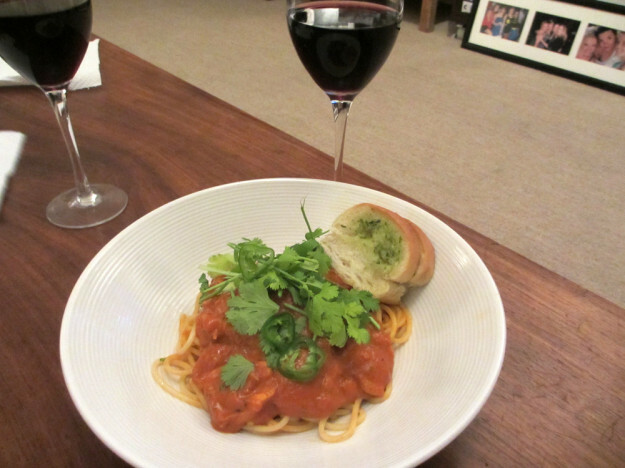 This entry was posted in Eat and tagged dinner with friends, pasta, yummy delish. I think it’s time for you to write a cook book T. You make cooking sound such fun! please can you share the full recipe. i absolutely love this dish and would love to try your version of it. Hi Louisa, sure I’ll update the post as soon as I can with the recipe! I just wanted to say your con pollo is absolutely FANTASTIC!!! It tastes just like primi’s one – my hubby had THREE servings when I made it. This recipe is definitely going to be a firm favourite in my kitchen! THANK YOU for sharing!!! YAY! That is so good to hear, I’m so glad that it’s something people are enjoying! Hi Martin! Yipppeeeee! So glad, please let me know how it turns out! Wow! It tasted AMAZEBALLS!!! Been wanting to make this for some time already but could not find the recipe. I went abit overboard with the chilli’s (LOL!) but family loved it nonetheless. Thanks for sharing! Hi Jen. Wooooohoooo! So glad you enjoyed it. It is one of my favourite’s! And I have totally gone overboard with the chilli before as well … but I don’t really mind. Another great thing is to serve it with garlic bread! Yummy deeeeeelish! So glad you enjoyed, I love hearing the feedback!